Just in time for Halloween, I've painted three spooky ghosts. On the left is a ghost and banshee from Citadel's 1989 Night Horrors. These were eBay finds. 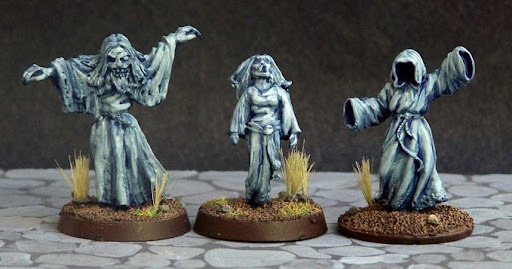 As these are slotta models, I mounted them on round plastic bases to go along with the rest of my GW LOTR models. On the right is a ghost from Mega Miniatures. It was originaly produced by the German company, Metal Magic. I got it for a dollar, but prices have been raised by 50 cents since then. I mounted it on a metal washer to put it at the same height as the other two ghosts. I figure ghosts are likely to haunt desolate places, so these bases have sparse vegetation, as one would find near a bog. Ghosts were a standard monsters from the Ultima PC series. Spirits also inhabit Tolkein's Middle Earth. Phantoms haunt the Dead Marshes and wights creep in the Barrow Downs. GameWorkshop's The Ruin of Arnor supplement offers a "Spectre" to the list of evil warriors in their LOTR game.